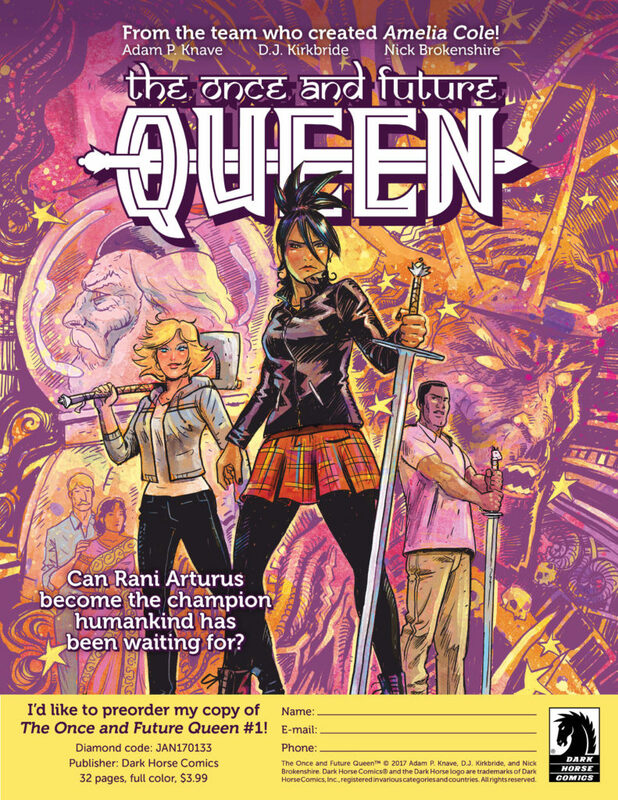 Order form for THE ONCE AND FUTURE QUEEN #1! Posted on January 16, 2017 by D.J. Here’s a handy order form courtesy of DARK HORSE COMICS for THE ONCE AND FUTURE QUEEN issue 1, out 03.01.17! 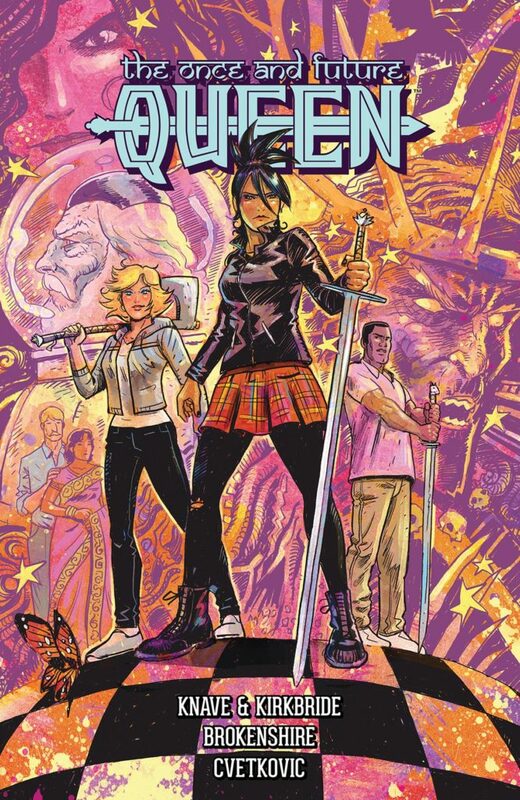 THE ONCE AND FUTURE QUEEN #1 is available for preorder! Posted on January 6, 2017 by D.J. Give your local comic shop PREVIEWSworld order code JAN170133 to “preorder” THE ONCE AND FUTURE QUEEN #1 from Nick Brokenshire, Adam P. Knave, Frank Cvetkovic, Shantel LaRocque, Dark Horse Comics, and me. The comics industry is wacky, with very little room for error when shops order their books. They use preorders to help determine how many copies of a book to order in general, if at all. Even if you’re already planning on buying the book when you see it on the shelves March 1, 2017, it’s vitally important to preorder it now. Thank you so much for your support of our comics and comics in general! Posted on January 3, 2017 by D.J. Posted on April 16, 2014 by D.J. 1:00pm to 2:00pm – AMELIA COLE AND THE UNKNOWN world signing at the IDW booth. 4:00 pm to 5:00 pm – NEVER ENDING signing with Robert Love at the Dark Horse booth. 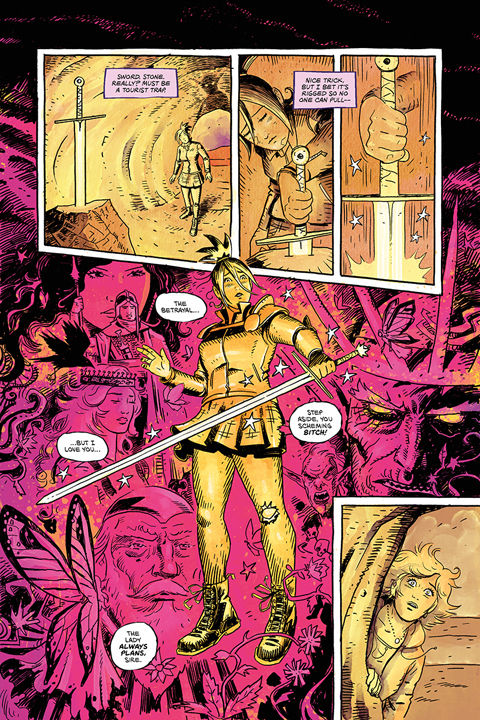 Table AA-025 with Robert Love and some great comics! I’ll be at WONDERCON 2014 with Robert Love! Posted on April 10, 2014 by D.J. Long time no post, website! Guess what? 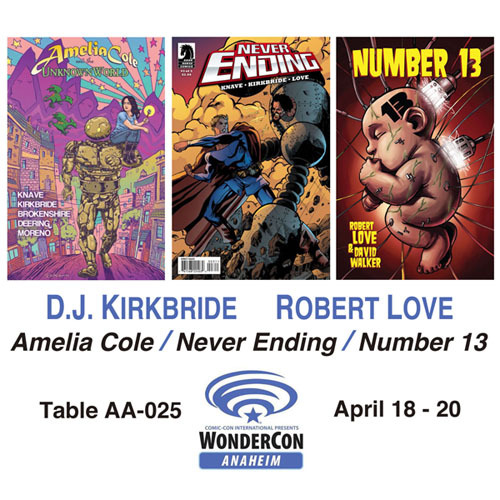 I’ll be at WonderCon Anaheim April 18 – 20, sharing Table AA-025 with NUMBER 13 co-writer & artist and NEVER ENDING artist Robert Love! We’ll have copies of IDW’s AMELIA COLE AND THE UNKNOWN WORLD trade, Amelia Cole T-shirts, Dark Horse’s NUMBER 13 trades, and issues 1 – 3 of Dark Horse’s NEVER ENDING. Stop by, buy comics, get a shirt, buy a sketch off of Robert, and have a great time!